Why does this happen with such consistency? (And not the kind of consistency we want!) There are always reasons, but overall, we lack consistency because we haven’t developed the routines to make consistency possible. We haven’t put in enough time before we start to reflect on why we want whatever we’ve committed ourselves to. We have not spent sufficient time setting our goals and understanding why those goals matter to us. Most importantly, we have not considered how this new initiative is going to impact the rest of our lives. If we have not adjusted our old habits (good or bad) to accommodate our new one (the initiative we are excited about), we have set ourselves up to fail. Consistency takes work—not only once we begin, but even before we start. The more passionate we are about following the guidance of our heart, the more consistently we will access its empowerment to enable change, This consistency is how we recondition ourselves to the truth that all experiences are meant for our good, especially those with which we struggle. More than anything else, the belief that the experience we are undertaking is meant for our good is necessary to be able to consistently, and quickly, commit to it. If you don't believe this experience is meant for your good, why would you bother with it? Sometimes, however, we have to work at convincing ourselves. Getting excited about something means your heart is in it. Access your heart empowerment by systematically exploring why you want to do something, and build a routine to make it fit into your life. Knowing the why and the when will enable you to commit to the change you want to make a consistent part of your life. Consistency comes from our ability to be dependable. People who are dependable can be relied upon to follow through with their commitments. They will get the job done because they have committed to it. Sometimes, we are very good at being reliable for others, but we forget to be reliable to ourselves. We apply different standards of behavior to others than to ourselves. It’s just another way of lacking consistency…but reliability is key to mastering this virtue in all aspects of our lives. To get a big job done in the workplace, people will spend significant time planning, whether alone or in meetings. There are often templates to follow, to make sure all the supplies, equipment and personnel are available. Planners will examine timelines, and make comparisons with other ongoing projects, to prioritize, and optimize efficiency. Everything that needs to be ordered, arranged for, or approved is put in place before anything begins. It makes sense in the workplace…why not in our personal lives? We all have a lot on our plates, and too often, we put our own needs at the bottom of the list. We feel we don’t have time to give ourselves the benefit of planning that our workplace selves rely upon. However, as the workplace example illustrates, it’s all in the planning. We can only be as successful personally, if we are as consistent as professionals in the planning phase. Consistency relies on good planning! There's a whole section in The Art of Heart Empowered Living book that provides some excellent planning strategies to enable good preparation. A virtue is a good or useful quality. In order to engage the virtue of consistency, it is useful to engage other virtues to help improve our own consistency. There are many to choose from but here are six that are the most appropriate helpmates. A key virtue is foresight. In order to anticipate the impact any new initiative will have on your day-to-day life, engaging foresight will be most productive. Time is a finite resource, so in order to do anything new, you are going to have to “find time” somewhere else. Once you understand what the time requirement will be, it is time to utilize the virtue of adaptability. To “make time” for the consistency you crave, you will need to adapt your schedule to accommodate the new activity. Some people are already very routine-oriented—perhaps too rigidly—so they will need to engage adaptability to incorporate a new routine into their familiar ones. Others lack, or even avoid, any kind of routine and go about their lives in a more or less haphazard way. For them, engaging adaptability might seem easy—but wait! To be truly adaptable so that consistency is possible, they’re going to have to build some routine into their schedules. Otherwise, consistency will remain an elusive quality. Once you discover where you will find the time (by becoming more organized, by establishing orderly routines, by restricting time spent with “techie toys”, etc. ), the virtue of reflection will be important. Take time to think or journal about why this new activity is valuable to you. Document the ways that consistency in this new endeavor will enhance your life. Reinforce your conviction by listing the reasons why it is so important to achieve consistency in this effort. Reflect upon, visualize, and truly believe you can make consistency happen. Part of your reflection about consistency will bring you to considering your own integrity in taking on something new. You have made a commitment to yourself, and perhaps you have voiced it to others. Consequently, it is important to be true to your word. Your integrity depends upon it. Engaging integrity provides another support in your quest for consistency. Partnering integrity with perseverance will build a strong foundation toward achieving consistency. When the going gets tough, when energy or commitment flag, perseverance will enable you to keep on keeping on. Without perseverance, any challenges that arise are likely to make the attainment of consistency virtually impossible. Perseverance is the fuel for the engine of consistency. Finally, to reach your goal of consistency, you need the virtue of self-reliance. Your consistency will only be as strong as your ability to depend on yourself to get things done. Having engaged all these other virtues will strengthen your belief in your own self-reliance, and therefore in your ability to attain the consistency you desire. 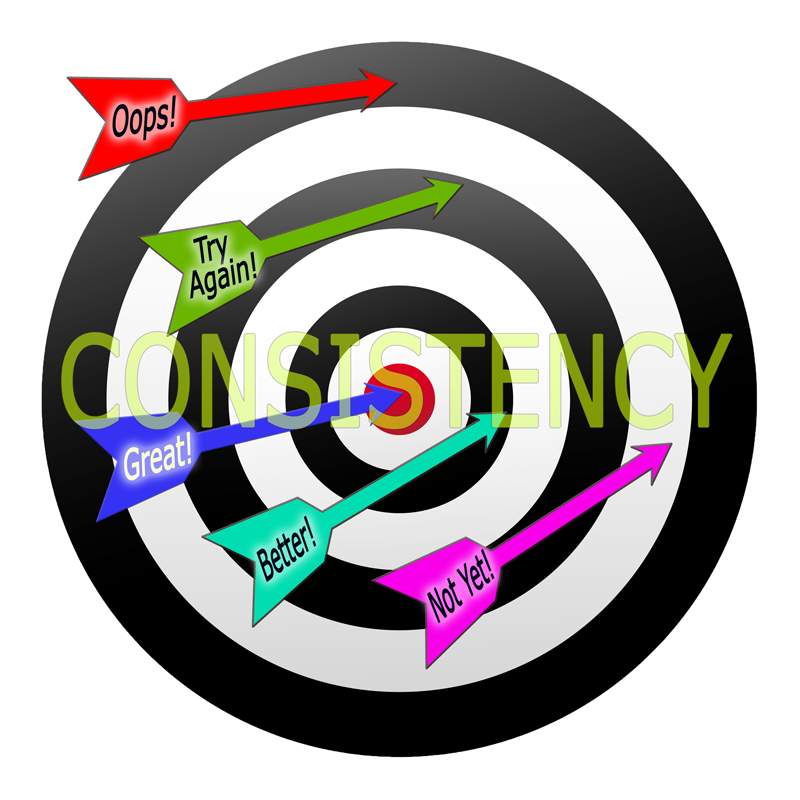 For if you cannot rely upon yourself to be consistent, no one else can safely expect consistency from you either. So, commit yourself to consistency. Start with a small, everyday kind of habit with which you struggle to remain consistent. Engage the same step-by-step process that a larger undertaking would require. Also, I recommend checking out The Art of Heart Empowered Living video (which includes a complimentary coaching offer) for more help in achieving your goals for consistency. I thought you were on holiday Marlene!! I enjoyed the thoughts and the integral nature of each component that is included in the blog, all emanating and supported by a heart-centred life. I look forward to your next one…….thank you!! Glad you enjoyed the post, Sandy. I recommend you read the book The Art of Heart Empowered Living until the blog posts start again. It’s available at http://www.heartcenteredrelating.com.